On the last episode, I shared with you my top 20 middle grade novels published in 2017 and unlike last year, where I had only one list, I decided to separate out the graphic novels since I read so so many more of them this year. And also – this way, I can share 30 books with you instead of just 20, so…. More love for more books is a good thing, right? Okay – let’s dive in! Here are my Top 10 middle grade graphic novels of 2017! If you already love Nathan Hale’s work from his fabulous Hazardous Tales series, then you’ll want to check out this book where he ventures into the realm of science fiction! This novel is set in a post-apocalyptic future where these creeptastic alien invaders are devouring every last trace of human-made metals and electronic devices. The only people keeping the flame of civilization going are a small band of survivors trying to outwit and outrun the aliens. The main character is a girl named Strata who finds a beautiful and rare robot pony named Kleidi which makes her a target of the aliens who are soon chasing after Strata and her brother. 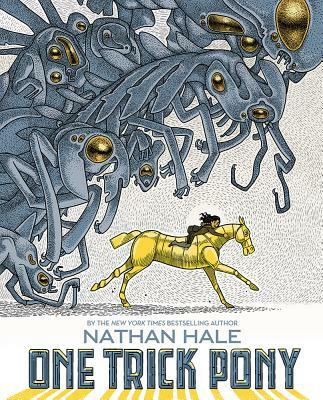 One Trick Pony is kind of like a blend between A Canticle for Leibowitz and an Hieronymus Bosch painting – both thought-provoking and beautifully creepy. 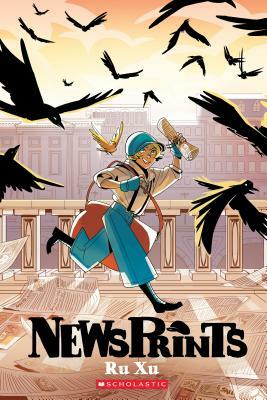 This is a gorgeous graphic novel with a 1920s flavor and a twist of steampunk that features a young orphan named Blue who is disguising herself as a newsboy for the newspaper called The Bugle. That paper is the only truth-telling news left in the war-torn city of Nautilene. When Blue meets a mysterious boy named Crow, they both need to decide whether to take the path of who they really are or take the path of how others see them. This is a powerful story about truth and ethics and humanity – and the warm, light-infused illustrations are just phenomenal. 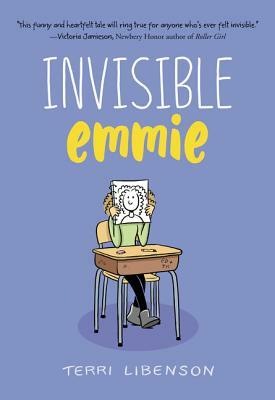 This debut graphic novel tells the story of the quiet, un-noticed, hero-in-waiting Emmie Douglass who is dealing with the challenges of seventh grade. Things like finding time to go to the bathroom between classes, the awkwardness of changing for gym, not having a cell phone and feeling left out of things, and…. being completely embarrassed in front of your crush. What makes this book stand out is that the chapters alternate between the main narrative of Emmie and the secondary story of Katie. And I loved how Emmie’s parts are text with lots of illustrations in softer blues, and tans, and mauves. And the sections from Katie’s point of view are that more traditional graphic novel format with panels in bright yellows and pinks and greens. The blend of those two styles is really well done and I loved the surprise twist about how they connect at the end. 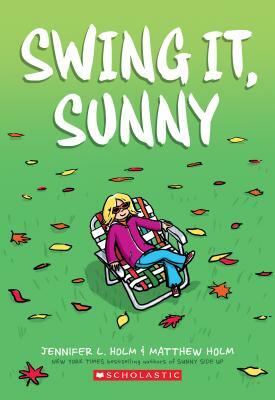 This is the sequel to Sunny, Side Up, and this book picks up with Sunny’s life right after her summer spent in Florida with her grandfather. She is now back home, it’s September 1976 and this story takes her through the school year, her complicated feelings about her brother Dale, who is now in boarding school, and the challenges of middle school. This is a book that is quick to read but has a lot of nuance to explore on rereads. Many of my students have read this one multiple times. It’s full of small slice of life seasonal stories and the 1970s nostalgia made me smile. This series has totally won my class over – with this second installment having quite the waiting list. This fantasy/fairy tale blend has a lot of humor, heart, and cool characters. 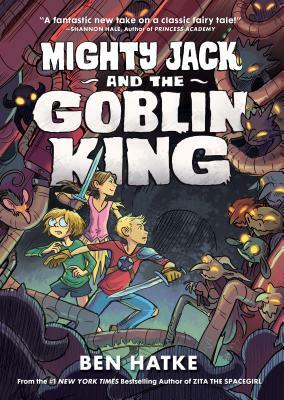 In this book, Jack, Lilly, and Maddy have ventured up the beanstalk into a world of goblins and giants and dragons who at turns harm and occasionally help. This is a great adventure story that I especially recommend to kids who want something fun. And I just loved the title character – the Goblin King – and that cameo at the end of this book. This classic, I’ll admit, was one that got past me! But after reading this graphic novel, I know I missed out on something special – this story is wonderful! And Brenna Thummler’s illustrations in vibrant greens with seasonal splashes of pinks and lavenders and oranges are softly stunning. I especially love her scenes of Anne and Diana in the woods with the sunlight dappling the trunks of the trees – it’s just enchanting! 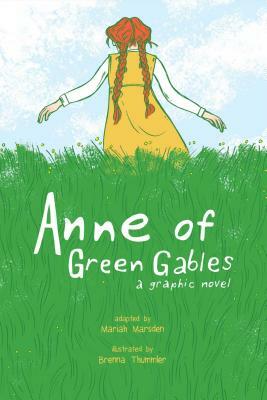 If you are already familiar with Anne of Green Gables – you’ll love reliving the magic of her story through this graphic novel. And if you are NOT yet familiar or have kids who might find the classic text a bit daunting, this is a perfect introduction to this beautiful story about resiliency and imagination. 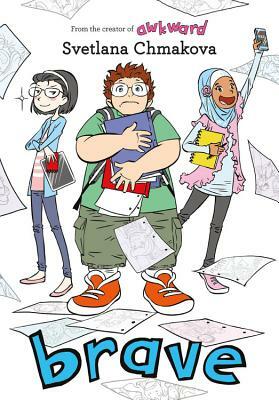 This book is set in the same universe at Chmakova’s debut middle grade graphic novel Awkward, which is also awesome, but this novel is centered on the character Jensen. In his daydreams, Jensen is a swashbuckling hero with dreams of becoming an astronaut or saving his schoolmates from the zombie apocalypse! But, in real life, he’s having a hard time in middle school – math class is difficult, his art club friends seem to be ditching him, and he’s being harassed by two boys at school. I love this book for its diverse set of characters and for a realistic exploration of harassment – both from bullies and from friends. This one is a must-get for classrooms and libraries serving kids 9 and up. This one took me a while to get to – mainly because my ten year old daughter made off with it as soon as it entered the house and then stayed up half the night reading it in bed with a flashlight. And – the two copies I brought into school were immediately snatched away – and I have no clue whose hands they’re in now and can only trust they’ll find their way home. 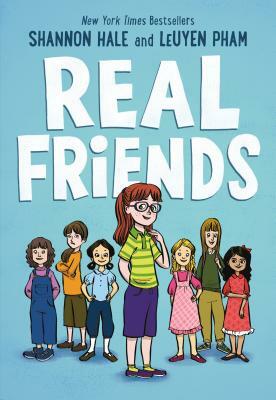 Real Friends is an autobiographical novel in a similar vein as Raina Telgemeier’s Smile and Sisters or the Holm’s Sunny Side Up. This book tells the story of young elementary school Shannon as she struggles to break out of her middle child loneliness and make good friends at school and at home. I think what makes this book so powerful and appealing to kids is that Hale clearly understands those seemingly small but socially HUGE details that happen in the lives of friends. Who sits next to who at lunch, who gets invited to whose house, the intentional but unseen-by-the-teachers jabs in gym class, the ranking, and the lying. And after Shannon’s first Kindergarten friend Adrienne moves and then comes back, she gets attached to what’s called The Group – these popular girls lead by Jen and her friend Jennifer. Adrienne is clearly IN, but Shannon is sometimes OUT. I also really loved the sections about Shannon’s family – especially her sometimes contentious relationship with her older sister, Wendy. And how this book is also about learning how to BE a real friend as well as FINDING real friends. Oh – how I LOVED this book! The swirling reds and oranges with shimmers of gold contrasted with those deep blues are simply a gorgeous feast for your eyes. Oh, and the story is pretty awesome, too! It’s about an Indian-American teenage girl named Priyanka. She finds a beautiful red pashmina hidden away in her mother’s old suitcase. A pashmina is an Indian shawl made of finely woven cashmere. 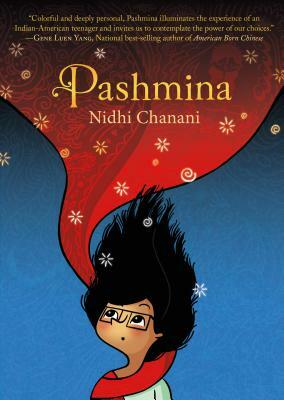 After wrapping herself in this mysterious pashmina Priyanka is transported to a mythic India of her imagination filled with both light and an subtly encroaching darkness. Her journey uncovers the line between fantasy and reality and she discovers some truths about herself, her family, and her future. I really loved how the sections alternate between panels in black and white and the rich, vibrant colors. If you want some behind the scenes info about this book, absolutely check out Matthew Winner’s interview with Nidhi Chanani on All the Wonders, Episode 393 ! 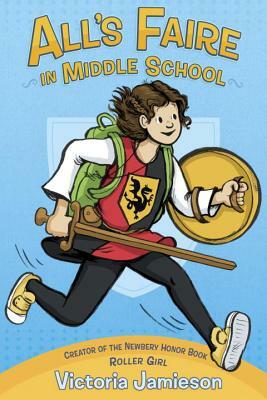 And – my number one most favorite graphic novel of the year is All’s Faire In Middle School! I have been waiting for a full-length follow up from Newbery honor author Victoria Jamieson and I gotta say – I might even like this one better than Roller Girl. She has a knack for digging deep into the heart and soul of a subculture. First roller derby and here – renaissance festival! This novel is about Imogene – an eleven-year-old girl who has grown up and been homeschooled within the Florida Renaissance Festival community. Her father works as a knight and she helps her mother run their family’s arts and crafts store there. She also has a little brother and a main thread in this book is a fracture in their relationship centered around his stuffed rat? Skunk? Ferret? Also – there’s tension around the fact that she starts her training as a squire, which mean more responsibility at the faire. And she’s going to public school for the first time and starting middle school. I loved this book so, so much – for the behind the scenes secrets of renfaire life, the fun banter of the Elizabethan speaking characters, the chapter introductions that look like illuminated manuscripts. It was just a full on pleasure to read! And absolutely please check out Jamieson’s conversation with Matthew Winner on Episode 386 of All the Wonders.